The fight for student safety in Clayton hit an all time high 48 years ago after a Mt. Diablo Elementary School student was struck and killed by a truck on Pine Hollow Rd. at Mitchell Canyon in May of 1971. Barbara Lynn Storm, who lived at 5827 Pine Hollow Rd., was riding her bicycle to school when she was struck by a dump-truck trailer coming from the nearby quarry on Mitchell Canyon Rd. The cities of Concord and Clayton attempted to shut down the quarry due to the high traffic and safety issue with three schools in the vicinity. Instead, several safety measures were put into place. On Friday morning, a fifth grade student at Mt. Diablo Elementary was hit by an SUV on Mitchell Canyon Rd. He was life-flighted to Children’s Hospital in Oakland, where fortunately he is expected to make a full recovery. Friday’s crash once again brings up the issue of student safety around local schools. QUESTION: If you were in charge of student safety, what is the first thing you would do to make sure no child is injured or killed while walking to school? photo: May 1971 Oakland Tribune article – click on images for larger view. I would teach them the same things my mother taught me ie: look both ways, a couple times, before crossing any street, always use the crosswalk, never-ever talk to strangers, walk with groups of other students, etc. I agree with Dennis. Educating the children would be first and foremost on my list of things that would go the furthest toward preventing future accidents.Always look in every direction before crossing the street. Make eye contact with drivers that are stopped at intersections to make sure they see you. Always use crosswalks. Never Jaywalk etc. etc. If the child is too young to understand or follow the rules then they must be escorted by an adult. Lots of other ideas but this would be number one. I agree with Dennis. It is about responsibility. Parents teaching it and the kids obeying the rules i.e. only using the crosswalk and looking before you cross. Although last time I posted about accountability Claycord censored me regardless of my post not including any vulgarity, profanity or anything that wasn’t innocent. So they’re probably going to censor this also. There is paid crossing guards. The quarry pays for one at Mitchell Canyons and pine hollow. First, make sure ALL elementary schools have school crossing guards. We had them at Mt. View in Concord in 1971. No idea if they were “paid” crossing guards, but they were effective for crossing Thornwood Dr. Volunteers are just as effective. Second, make sure your child knows road safety, including look both ways, use a crosswalk and use the buddy system (safety in numbers) and walk, don’t run. You could fall. If you feel your child can’t make it to school safely, take the child to school yourself. Some people live too far away or they have to cross busy streets. 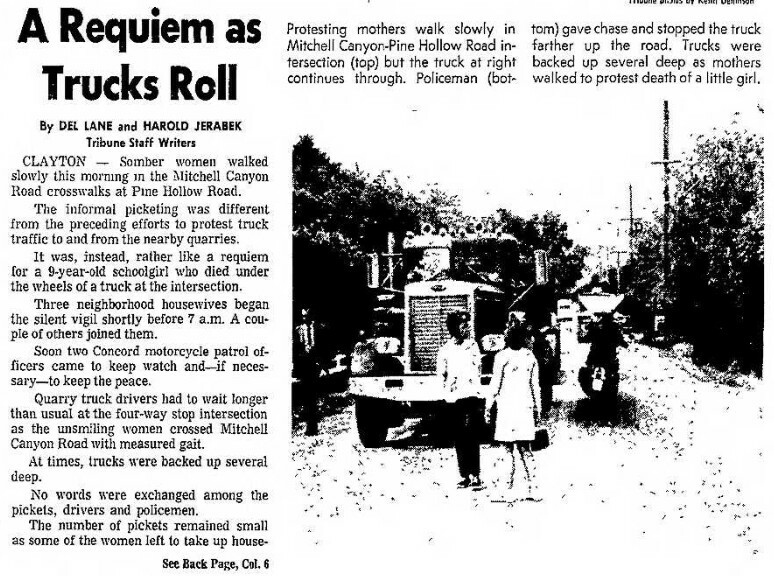 48 years ago they tried to ban the quarry trucks. Friday a girl was hit by an SUV. Are we to now try to ban SUVs now ?????? Maybe in another 48 years the hover car will tried to be banned after an accident. I am truely sorry for ANYONE getting hit by anything but 1 accident every 5 years (as someone posted on this topic) or even every 48 years is not reason to change the system or try to ‘ban’ anything. Hover car will never ever happen.Humans aren’t responsible enough to have everyone flying.Nobody will stay at ground level and mid air crashes would happen 1000’s of time a day and then land on people.It wont ever happen in the USA,or anyplace else.Nice dream though.Humans could never handle it.The same as personal hand held lasers.They would al be used as a weapon.Just flying drones are such a hazard now,if the givt wasn’t making so much on the taxes from all the sales they would be illegal too.Kind of like cigarettes and alcohol.Too profitable for the govt to ban. @Angel B – yes I would say that. Banning something that has been around for 50 years (the trucks) is like someone who moves in to the landing path of the airport then after a year starts a campaign to get the airport closed because it’s too loud. I would be devastated if my child was hit by a car (or a truck) but I would not try to destroy the life’s of everyone that works at quarry just for payback. How many people still was their clothes at the river, beating them with rocks to get them clean? Society makes progress and in the process makes certain ways of life obsolete. How many occupations have been impacted by the development of technology? When something is determined to impact society negatively, it is deemed obsolete and replaced by a safer, more efficient, cheaper, or otherwise better way of doing things. Noone is trying to “destroy the life” of people who work at the quarry. There is just a better way of doing things that doesn’t include a quarry at that location … for many reasons. When is that quarry supposed to close? Who is trying to keep it open? How much do you want to bet it never closes? when they have removed all of MT Zion,they will go away.Only another 100 years or so. The quarry is owned by Cemex. That’s right, a Mexican company owns it. Welcome to globalization. Obviously they want to keep it open since it’s profitable. Rich…. Cemex had a contract. It is supposed to close. The surrounding neighborhoods are not all wealthy families, that’s BS. The economy is great! There aren’t enough truck drivers & heavy equipment operators to fill all the open jobs nowadays as it is…. nobody’s going to go broke. Your whole argument is fubar. Ok back to the question asked. First I would send out flyers to every parent telling them the right and wrong way to drop off their children at clayton schools (for example, DONT STOP ON CLAYTON ROAD AND LET YOUR CHILD OUT OF THE CAR). Then educate the children IN school on what to do when walking around cars. Also ask every parent to volunteer to be safety patrol FOR 30 MINUTES before and after school. I know that JUST A FEE YEARS AGO when my child went to Mt. Diablo Ele. they had volentee parents helping watch before school and after for safety. @MattfromConcord 5 children have been hit in recent years. The intersection referenced from when the child was killed has a paid crossing guard that is paid for by Cemex after what happened. The safety issue now is closer to the school. In front of the school Clayton PD used to provide crossing guards. They stopped and then a parent volunteer took over until her kids left the school. The issue is we need crossing guards in front of the school. And the intersection where this accident yesterday occurred needs safety measures…crosswalk, stop sign, crossing guard something. 5 kids getting hit is insane. Boy do I remember this. I was in 3d grade at Mt. Diablo when this happened. Everyone of a certain age remembers Barbie Storm. RIP. Sad almost 50 years later those quarries are still in operation. Traffic Safety education at home AND in school, crossing guards, and illuminated crosswalks. Then periodic law enforcement sweeps to educate (through financial incentives) distracted drivers. This is one of the many things that will become completely untenable when Concord builds out the CNWS and fills in the downtown with projects. How about we start giving tickets to the parents who are jaywalking their kids acros the street rather than walking 100 feet farther to use the crosswalk with the crossing guard. The parents are just teaching their kids horrible habits and it’s so dangerous! And let’s ticket those damn parents who are stopping at the red curbs to let their kids out quickly but also blocking the flow of traffic. It’s absolutely maddening the lengths people go to because their in a hurry and too special to follow the rules of the road. LittleToe – Yes. This starts with the parents modelling appropriate behavior. The intersections at both Clayton & Mitchell and Mitchell & Pine Hollow are controlled and have crosswalks, yet parents will lead their kids by the hand across the middle of Mitchell at Four Oaks just to save one minute. This is complete selfishness. I see this every morning. The pervasive attitude that says what I’m doing and where I’m going is more important than what you are doing and where you are going. The traffic at the Pine Hollow and Mitchell Canyon intersection far exceeds what it was designed to carry for a residential area. This increased flow of traffic is impacting surrounding neighborhoods and the pedestrians using it. avoiding the signals and intersections on Clayton Road. 4) increased trips by larger trucks to and from the Cemex quarry. 5) making the Oak Street location the only vehicle drop off and pick up location allowed for the school. And, finally, I really have to say that the drop off and pick up at that school seemed to work much better BEFORE the city made the street in front of it one way. I am however, inclined to think that for vehicular traffic dropping off and picking up, Oak Street should be the only location allowed. @gittyup – sorry to say but reiterating the situation doesn’t solve anything. if you don’t have a solution you don’t have a voice. I can say all the facts and figures as well but I don’t have a solution. I guess the only solution I can think of is education. Education for the adult and education for the children. Alll those ideas are good ideas, but my two favorites are closing Cemex, and making Oak Street the only vehicle pickup and dropoff point for the school. I’m also looking forward to more signals and stop signs on Pine Hollow … as promised. Those are solutions. @MattfromConcord, who are you to say who has a voice? GHEEZE! Until Crossing Guards, Traffic Cameras or some other traffic calming program is implemented check with Street Smarts Diablo and see if they can commit to bicycle/pedestrian safety training at the school. I’m amazed on how long mdusd ignores. Parents have pleaded for years to make changes to prevent accidents. The schools solution was always to try and get parent volunteers to monitor. Really?? Many parents have said it will take another accident to get any attention…. MDE was built to house 300-400 students. There are over 800 families all trying to get to the school at the insane early start of 7:40…Parents pleaded with the district to return to the 8:05 start time to help get parents out of commute traffic. The district ignored 100s of letters from parents. The newest drop off procedure was changed 4 years ago. When the procedure was introduced to families. It took all of 5 min. For several of us to realize that the new drop off procedure was crazy and dangerous. Head to the school at pick up and watch. Pine hollow backs up. Parents waiting for the dismissal bell. Parents who need to make a right on Mt. Zion end up slowly driving on the wrong side of the street. Each hoping they won’t hit an oncoming car. The safest way to get this amount of kids safely to school is to only permit kinders/first graders at the school entrance. 2nd-5th back of the hill with 2 staff monitoring at the bottom and the top of the hill. Crossing guard and police helping the increase of traffic. Happy to share any research with anyone that wants to plead to the district/city of Clayton… I have tried for years. Board members of City of Clayton have been in a mental meltdown coma for way too long. Time for you to WAKE UP! Little Toe totally agree. I’ve been saying it for 25 years to anyone that will listen, children are taught by parents actions. Parents jaywalk, their children will. Parents drive like complete jerkoffs around MDE. I pleaded with CPD to do something, anything. They said they are unable to post an officer at the school. Sometimes you have to think outside of the box. If you buy a house near a quarry, there are consequences. 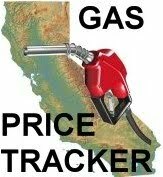 Anytime you buy a house near an airport, refinery, quarry, school, coliseum, freeway, etc. you need to think about what you’re getting yourself into, and whether or not the cons are worth it. There are ways of “protecting your family from this assault.” Think wisely before you sign on the dotted line – in any neighborhood. Your children will be safer. Thank you. It is such a shock to look down from Mt. Diablo to see Clayton scarred and damaged like this. I remember the first time I saw it. I couldn’t believe Clayton would knowingly allow anyone to do that to their pretty little town. Quit posting environmental issues an diesel truck pollution lies just to arouse your liberal selfish cohorts. In both cases the quarry and trucks comply and meet all California STRICT environmental and emission standards that far EXCEED Federal standards.I am sick of the ill-informed spreading false facts you included. Cemex is not a very good neighbor and the roads and air have gotten much dustier than in previous decades. Their public relations employees will no longer meet with concerned neighbors. In the past the quarry had a flagman at the exit to the quarry to ensure that trucks stopped at the quarry stop sign before entering Mitchell Canyon Rd. Please report spilled rocks and sludge on Mitchell Canyon when you see it. US Fish and Game can be called as well as the dirty runoff goes into the creek. Many of us have seen the quarry trucks speeding and I’ve even seen a truck illegally come down Pine Hollow and turn right onto Mitchell Canyon. That is an impossible turn for a big truck and they drove over the curb and onto the sidewalk. @Clayton Squirrel report your complaints to Cemex plant manager instead of complaining here if you truly want a solution to your beef with them. We certainly do communicate with them. They no longer want to meet with our neighborhood committee and have back tracked on some proposed remediation. In the past (before Cemex) we had the business card of the general manager as he wanted to hear of any issues directly so that he could bring up issues with the drivers directly. @jon S : dude theyre already building hoover cars. You tube it. Its already happeningo in india bro. Check it out. Its pretty cool but. I do see your safety concerns for the hoover cars.